At Chella all dishes are prepared on daily basis. Meat, fish and herbs are delivered daily and are never frozen. Head chef Keyvan is a partner in the business and hence he ensures the food is fresh flavoursome and seasonal. 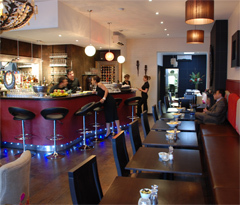 The ambience of the restaurant is modern and relaxed. Chella restaurant was first opened in Tehran 50 years ago by the father of one of the owners and was a very well known local venue. Now the new restaurant takes the traditional Iranian food forward to a new clientele. The restaurant offers a varied selection of fresh succulent and aromatic dishes within a modern, comfortable and cosy ambience. Chella welcomes parties and can add its own edge to your party with a well-constructed party menu and entertainment by the resident musician. The star attractions are the kebabs, served straight off the grill, accompanied by steam-cooked rice. Freshly baked bread and an extensive selection of starters and side dishes complete your experience of the Persian cuisine. Entertainment is also on the menu with live Persian music on selected nights. Book online and receive 25% discount. Persian cuisine is known for its well marinated meat and vegetable dishes, Kebabs (barbecued meat, poultry or fish), and a myriad of traditional aromatic stews that are normally served with rice.